GMAT math questions are very much important for Bank Recruitment Exams. GMAT practice questions are given below. You can follow various problem solving strategies to complete these questions. You can even perform GMAT practice test at your home. 1. One of the sides of a square measures 10 cm in length. If we increase the size of two opposite sides by a couple of centimeters and decrease the length of the remaining two opposite sides by the same measure, then what will be the area of the resulting figure in meter? It is given that the sides of the square measure 10cm in length. Therefore the area of square is side * side = 10 * 10 = 100 square cm. Now, the question says that the length of some two opposite sides is reduced by a couple of centimeters i.e. it is reduced by 2 cm and the length of the other two opposite side is increased by the same measure i.e. 2 cm only. Hence, as per this, the length of the sides of the square has changed to 8 cm and 12 cm respectively. From this we can conclude that the resulting figure is a rectangle. Now the area of a rectangle is 2 * length * breadth = 2 * 8 * 12 = 192 square cm. But the question asks the area in meters. Hence, 192 cm = 192 * 10-3 meter = 0.192 square meter. Hence the correct answer is option e.
2. If a man drives a car at a speed of 50 km per hour; then calculate the distance covered by the man in 10 minutes if he is driving at the same speed constantly. It is given that man is driving at a speed of 50 km/hr for 10 minutes. Now, 1 hour = 60 minutes Therefore, x hours = 10 minutes → x = 10 / 60 → x = 0.1667 hours. 3. If the scale used for drawing a map states that the actual distance of 50 km is represented by 1cm on the map; then according to this scale what will be the actual distance between Los Angeles and Washington D.C. if Washington D.C. is 12.22 cm away from America on the map? It is given that, 1cm on map is equal to 50 km on the road. We have to find out the actual distance for a distance of 12.22cm on the map. 1 cm = 50 km \ 12.22 cm = say 'x' cm. ∴ x = 50 * 12.22 = 611 km. 4. It is given that the weight of an empty box is 1000 gm and the total weight of the box when filled with apples and mangoes is 10kg. If there are 3 dozens of apple in the box and the weight of each apple is 200 gm whereas the weight of every mango is 300 gm, then, find out the total number of mangoes in the box. But, it is given that weight of every mango is 300 gm. Therefore, there are in all 6 mangoes in the box. Must Read: GRE Sample Questions on Quantitative Comparisons. 5. If we increase the area of a circle by 32 % then, calculate the approximate increase in the radius of the same circle in terms of percentage. Now, we have to find out the percentage increase in the radius if we increase the area by 32 %. This is 32 percent increased area of the circle. Say 'x' is the percentage increase in the radius of the circle. On solving the equation we can say that, for 20% increase in the radius the area of the circle increases by 32%. 6. Tim, Tom and Max decide to go out for dinner. Tom had $ 50 whereas; Tim and Max had $ 110 and $ 400 respectively. The bill charged them $ 113 for their dinner. They paid $ 120 and the extra $ 7 was given as a tip to the waiter who served them. They first decide to share the bill equally. But, since Tim had very less money with him he paid only 25 % of the bill whereas; Tom and Max paid 35 % and 40 % of the bill respectively. Calculate the amount of money paid by Tim. Tom had $ 50, Tim had $ 110, and Max had $ 400 respectively. The total bill for the dinner = $ 113. They paid $120 and gave the extra $7 as tip. From this we come to know that Tim paid $ 30 for dinner. 7. The measures of the sides of an irregular polygon are given in the figure as follows. 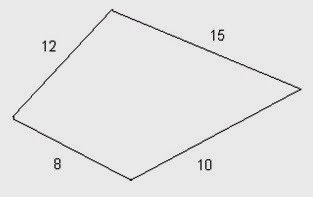 Look at the figure and calculate the perimeter of the irregular polygon. Perimeter of an irregular polygon is equal to the sum of all its sides. 8. Consider the following figure and find out the ratio between the areas of the largest and the smallest circles. Given that all the circles are drawn considering the same center i.e. all the circles are concentric. 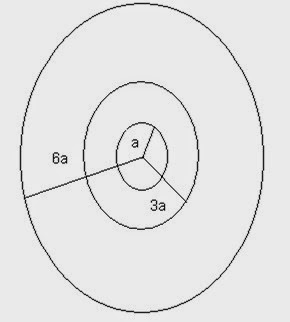 According to the figure, the radius of the circles are denoted by a, 3a and 6a where 'a' can be any variable that represents certain value or some unit of measurement. From the figure we can say that the radius of the smallest circle is 'a'. The radius of the middle circle is 3a and the radius of the outermost circle is 6a. Now, we have to find out the ratio between the areas of the biggest and the smallest circles. 9. If a + b = 10 and a – b = 20, then what will be the value of a/b? 10. The ratio between the ages of Mary and her mother is 1: 2 and that of Mary and her father is 1: 3 at the time of Mary's birth. Mary is 10 years old now. Find out the ratio between the ages of Mary's mother and father at this age of Mary. Now, Mary is 10 years old. Her mother's age is 2x i.e. 2 * 10 = 20 and her father's age is 3x i.e. 3 * 10 = 30 at this age of Mary. Must Read: GMAT Sample Question on Critical Reasoning. 11. If 45x = 1024, then find out the value of 'x' to get this result. According to the data given in the question, we know that the result is a multiple of 4. Also, since 4 is raise to power 5 first we will find out the result of 4 raise to the power 5. 12. In some arithmetic sequence, the sum of the digits of the third term is 27 and the fourth term is 81. What is the fifth term in this arithmetic sequence? According to the data given in the question, all the numbers are in arithmetic sequence. The third term in the sequence is 27 and the fourth term in the sequence is 81. From this we can say that the numbers are in the sequence of increasing powers of 3, because 3 raise to the power 3 = 27 and 3 raise to the power four is 81. This means we have to find out the value of 35, which is ultimately the fifth term of the sequence. 13. Andrew purchased 3 science text books and 5 mathematics text books. If the average cost of Andrew's science text books was $75 and the average cost of his mathematics text books was $150, then find out the average cost of the total number of books purchased by Andrew. According to the data given in the question, Andrew purchased 3 text books of science and 5 text books of mathematics respectively. 14. If (a/b) = 0.6789, then find the value of the reciprocal of the same fraction. We have to find the value of the reciprocal of this fraction which means we have to find the value of (b/a). 15. If 3 - a = 6(1 - a), then find the value of 'a' according to this equation. 16. A line named as XY consists of two other points namely A and B between the two end points. The distance between the points X and A is 10 units and the distance between the points B and Y is also 10 units. The line segment XB measures 20 units in length. Find out the distance between the points A and B respectively. According to the data given in the question, we can draw a line XABY of total length as 30 units. The length of line segment XA is 10 units. The length of line segment YB is 10 units. The length of line XY is 30 units. 17. If the square root of the cube root of some positive integer is 2, then find the integer which results in this answer. According to the data given in the question, the square root of the cube root of some positive integer is 2. Let this integer be 'a'. 18. If 5a + 6b = 30 and a – 6b = 6, then find the value of the variables 'a' as well as 'b'. Hence, the derived values of 'a' and 'b' are 6 and 0 respectively. But, neither of the options contains this answer. 19. The integer 'a' is directly proportional to the integer 'b' and a/b = 7. Find out the value of integer variable 'b', for the value of the integer variable a = 1.5. If two quantities are directly proportional to each other, indicates that they always have the same quotient. Now, according to this property and according to the data given in the question, as 'a' is directly proportional to the integer 'b' and a/b = 7 (-----i); then they both will always have the same quotient irrespective of the values of both 'a' and 'b'. 20. Find out the area of the figure with all its sides equal in length if it is given that the perimeter of this regular polygon is 100. According to the data given in the question, the figure is having all its sides equal in length. From this we can conclude that the given geometrical figure is a square. Now, it is given that the perimeter of the square is 100 units. Now, we have to find out the area of the square. Must Read: Important General Knowledge Questions. 21. Solve the following and find out the answer for ((x6)3 * (x5)6)/ (x3). In this problem, we have to make use of all these three properties in order to get the correct answer to the question. Now we will solve the division part i.e. x48/x3 = x 48-3 = x45. 22. If the volume of a sphere is 75 cubic centimeters, then find out the area of this sphere in terms of centimeter square units. Formula for the volume of a sphere is V = 4/3(pi*r*r*r); where 'r' is the radius of the circle. According to the data given in the question, volume of the sphere V = 75 cubic centimeter. Now, formula for the area of regular sphere A = 4*pi*r*r; where 'r' is the radius of the sphere. 23. A man 2 meters tall casts a shadow of 1.5 meters in length. At the same time, some building next to the man casts a shadow which is 6 meters in length. Calculate the height of this building in centimeters. Let (h) denote the height and (sh) denote the shadow. Let (ht) be the height of the building that we have to calculate. But, we have to find out the height of the building in terms of cm. Hence, the height if the building whose shadow is 6 meters in length is 800 cm. 24. 5 men and 3 women can do a piece of work in 10 consecutive working days. The same piece of work is done by 7 men and 2 women in a time period of 8 working days. Find the number of days required to complete the same amount of work if there are 9 men and women working on it. 5 men + 3 Women can do the piece of work in 10 days. 7 men + 2 Women can do the piece of work in 8 days. As equation I and ii show the work done in 1 day we can equate the number pof men and women working to complete the task. ∴ We can say that, 11 men can do a piece of work in 10 days. But, we have to find out the number of days required to complete the same amount of work if there are 9 men and women working on it. Now, 9 women = 9 * 2 = 18 men. ∴ 9 men + 18 men = 27 men, can do the work in, (11*10)/ 27 = 110/27 = 4.07 days. We will have to find the quotients of all the fractions first and then compare them to find the correct answer to the question. Must Read: SAT Sample Questions on Sentence Completions. 26. Out of the two candidates who were standing against each other for the post of an MLA, one of them got 40 % of the total number of vote and the other who won the election got the remaining 60% of all the votes. The defeated candidate got 460 votes less than the number of votes secured by the winner of the election. Find out the total number of votes and the total number of votes gained by the winner of the election. Then, 40% of total number of 100 votes = 40 = number of votes secured by the loser. And, 60% of total number of 100 votes = 60 = number of votes secured by the winner. ∴ Difference in the votes secured by the two candidates = 60 – 40 = 20. Hence, we can say that, for total number of votes equal to 100, the difference in the votes earned by the two is equal to 20. But, we also to find out the number of votes secured by the winner. It is given that the winner secured 60% of the total number of votes. 27. If a - b = 3 and a2 - b2 = 25, then find the sum of both the variables 'a' and 'b'. Now, according to the data given in the question, a - b = 3 and a2 - b2 = 25. 28. If x + y = 6 and x2 + y2 = 30, then find the product of both the variables 'x' and 'y'. 29. If f(x) = 4(x + 2), then what will be the value of f(3)? We have to find out the value of f(3). We have to find the value of the function g(2,3).